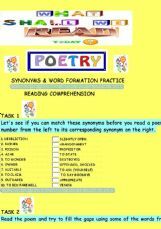 This is a vocabulary task based on a poem by F. Letras (with his kind permission) and it contains synonyms, word formation and reading comprehension. I hope you find it useful. The poem has an interesting ending, so you might even use it (for Halloween maybe?) as an open-ended poem with your stodents and have them guess the ending before doing the OE. This is an exercise that makes students practice different skills. Reading, listening and writing. It also makes them practise vocabulary in context and creates the possibility of using role-plays, debates, etc as after activities. The video could be widely exploited for vocabulary, description, examples with past continuous, etc. Hope you enjoy it! 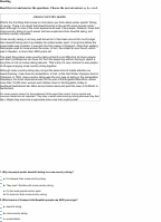 I made this online reading activity to make students reads outside the classroom. 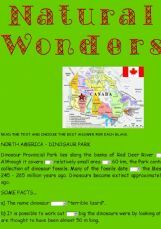 We have been working with the thematic unit NATURAL WONDERS. The text has been taken from the book Natural Wonders of the World - Macmillan Publishers. I hope you find these activities useful. I created this OE with my son in mind. (His English level is not yet there, but I�m hoping the topic will inspire him!) 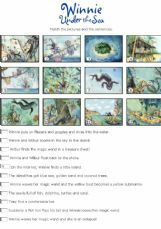 The exercise contains several tasks - a T/F one, two reading tasks with comprehension and fill-in and a listening task with the theme song of a dragon movie. There are pics and animated dragons inside, so if you like dragons, fire (breathe) away! An elementary reading activity for beginners. 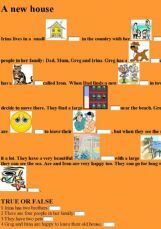 Short story to practice reading comprehension through May�s description and daily routines. 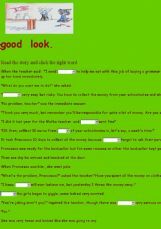 A reading comprehension followed by questions . The multiple choice accompanying the story is intended as a revision of indefinite pronouns.